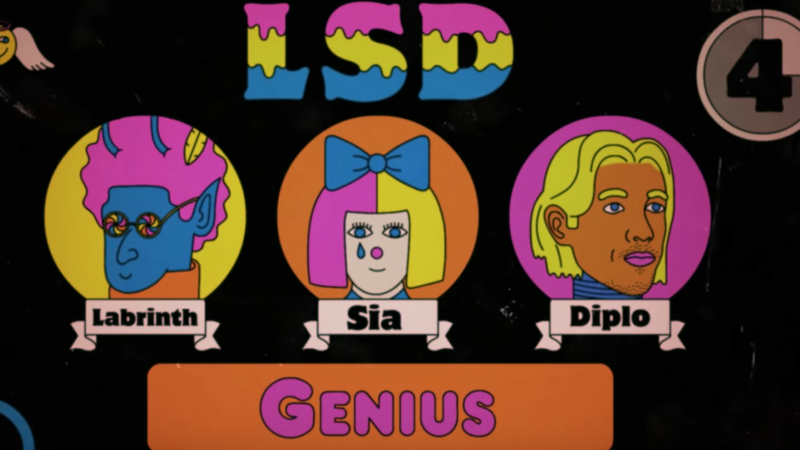 Diplo, Sia and UK-based artist Labrinth have joined forces, forming a group utilizing the moniker LSD. To celebrate their new creative endeavor, the trio has shared their first collaboration, a track titled "Genius." "You'll be my Einstein, my Newton, my Galileo, and my Hawking / Boy, put that pep in my step / Put your arm on my neck while I'm walking / Please understand, yeah I have fallen for you, you," Sia sings during the second verse. The first offering as a group is a brilliant mash-up of the talents of each respective artist, with both vocalists showcasing their experimental nature over a intriguing, synth-pop soundscape provided by Diplo, Labrinth and Jr. Blender. The song release was also paired with a colorful, psychedelic visual featuring illustrations by Gabriel Alcala, further exemplifying the inspiration behind the group's chosen name and boundaryless direction. While the song's reveal was met with very little accompanying information, fans are already hopeful the freshly-announced trio will have more music on the way. Check out the debut collaboration between Sia, Diplo and Labrinth as LSD, below. New Music Video: Chance the Rapper and Jamila Woods head home for "LSD"
Today In Music | Diplo Snaps new snippet of "Hold Up"